The realest Santa Claus music has ever known. In the spirit of Mark’s downer — worst Christmas presents you received? Things you didn’t get that you wanted? Or, if you’ve had a nice morning — the best thing you found under your tree or in your stocking? 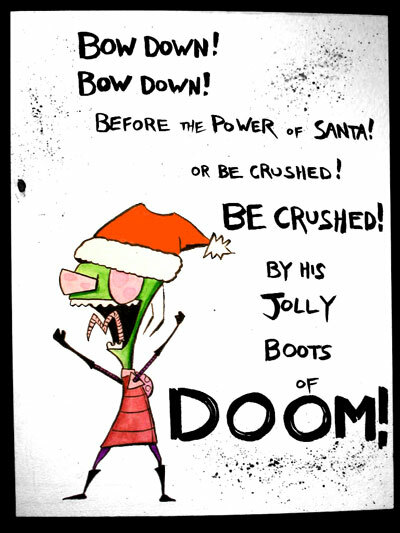 NOTHING FILLS ME WITH YULETIDE JOY LIKE INVADE ZIM. best gifts this year: hair clips from the dollar store and a used purple bike. I got some great presents this year: a Film forum membership, the new Steve Reich box set, and my boss (a graphic designer and artist) gave me one of his Iris prints, totally out of the blue. Even better, I think the presents I gave were well liked. I got one of my nephews a “sonic cannon” from the Brooklyn Superhero Supply Co. (another part of the Dave Eggers franchise), and he and his parents were reportedly enthralled. Makes up for the Superhero Oath I had to take when i bought it. to answer tim’s question from way back when, yes, i got my turntable, but i had to wait until yesterday to use it. nate bought me a 12″ of hall and oates’ “private eyes,” in honor of my thrill listening to H&O on vinyl at Lisa’s and John’s this summer. Dave got me a fantastic, mint-condition morton feldman LP — all “early years” multipiano pieces from the 50s. we used it to christen the new machine. steph got me a 3CD anthology of string bass music from 1925-41 — fine, fine stuff. ooh ooh, i love morton feldman! excellent choice for the new table’s first spin. did you get the dust-to-digital anthology “how low can you go?”? (note necessity of two question marks.) cool. i got jen their anthology of sacred harp singing, plus the companion documentary. they do great work. pick up their old-timey christmas for next year. i got some fly vintage shirts and some cool cd’s, including a live sandy bull. jen and i initiated what i hope to be our new tradition: latkes on christmas day. here’s what’s weird about the whatsit. john and i just got back from post-christmas amoeba trip where john picked out two morton feldman albums for himself…and then i check in and y’all are talking about morton feldman. what can we say? TGW is a magnet for good taste (and tasteless humor). tw: yes– it’s the “how low can you go?” anthology. their old timey christmas album is “where will you be christmas day?” — right? yeah, that’s a nice one. i never pulled it out this year. i’m going to go dig for it now. Scott got a special surprise for my sisters and me: a board game called “Heartthrob” circa 1988, with cards picturing various feathered-hair hunkies with names like “Ryan” and “Joey” all posing in different attitudes (acid-washed with a Duran Duran hat, bookish with glasses, muscley in a football jersey). So sorry it’s too big to pack for the Whatsit gathering, but I think we’ll all have dream dates old and new that night . . .